Once Buddha Shakyamuni, the World-Honoured One, was traveling throughout the various lands to teach and convert the people. When he arrived in Vaisali, he rested under the Tree of Music, accompanied by 8,000 great Bhiksus. An immeasurably great Assembly, including 36,000 great Bodhisattvas as well as kings, great ministers, Brahmins, laymen and women, the Eight Types of Divinities and other human and non-human beings, gathered respectfully around the Buddha as He preached the Dharma. "World-Honoured One, may I please request you to explain the various names and titles, the great, past vows and the superlative virtues of the Buddhas, so that those who are listening to you will be freed of karmic obstructions, while in the future, sentient beings in the Dharma Semblance Age will also derive great benefit and joy." "East of this world, past countless Buddha-lands more numerous than the grains of sand in ten Ganges Rivers - there exists a world called Pure Lapis Lazuli. The Buddha of that world is called the Medicine Buddha Lapis Lazuli Radiance Tathagata, Arhat, the Perfectly Enlightened, Perfect in Mind and Deed, Well Gone, Knower of the World, Unsurpassed Being, Tamer of Passions, Teacher of Gods and Men, Buddha-World-Honoured One." Manjushri, when the World-Honoured Medicine Buddha was treading the Bodhisattva path, he solemnly made Twelve Great Vows to grant sentient beings whatever they desired. "I vow that in a future life, when I have attained Supreme Enlightenment, my body, inside and out, will radiate far and wide the clarity and flawless purity of lapis lazuli. This body will be adorned with superlative virtues and dwell peacefully in the midst of a web of light more magnificent than the sun or moon. The light will awaken the minds of all beings dwelling in darkness, enabling them to engage in their pursuits according to their wishes. "I vow that in a future life, when I have attained Supreme Enlightenment, I will, with infinite wisdom and skilful means, provide all sentient beings with an inexhaustible quantity of goods to meet their material needs. They will never want for anything. "I vow that in a future life, when I have attained Supreme Enlightenment, I will help all the countless sentient beings who cultivate the path of morality in accordance with my Dharma to observe the rules of conduct (Precepts) to perfection, in conformity with the Three Root Precepts. Even those guilty of disparaging or violating the Precepts will regain their purity upon hearing my name, and avoid descending upon the Evil Paths. "I vow that in a future life, when I have attained Supreme Enlightenment, sentient beings afflicted with various illnesses, with no one to help them, nowhere to turn, no physicians, no medicine, no family, no home - who are destitute and miserable - will, as soon as my name passes through their ears, be relieved of all their illnesses. With mind and body peaceful and contented, they will enjoy home, family and property in abundance and eventually realize Unsurpassed Supreme Enlightenment. "I vow that in a future life, when I have attained Supreme Enlightenment, those women who are extremely disgusted with the <hundred afflictions that befall women and wish to abandon their female form, will, upon hearing my name, all be reborn as men. They will be endowed with noble features and eventually realize Unsurpassed Supreme Enlightenment. "I vow that in a future life, when I have attained Supreme Enlightenment, I will help all sentient beings escape from the demons net and free themselves from the bonds of heretical paths. Should they be caught in the thicket of wrong views, I will lead them to correct views, gradually inducing them to cultivate the practices of Bodhisattvas and swiftly realize Supreme, Perfect Enlightenment. "I vow that in a future life,, when I have attained Supreme Enlightenment, those sentient beings who are shackled, beaten, imprisoned, condemned to death or otherwise subjected to countless miseries and humiliations by royal decree - and who are suffering in body and mind from this oppression - need only hear my name to be freed from all these afflictions, thanks to the awesome power of my merits and virtues. "I vow that in a future life, when I have attained Supreme Enlightenment, if sentient beings who are tormented by hunger and thirst - to the point of creating evil karma in their attempts to survive - should succeed in hearing my name, recite it single-mindedly and hold fast to it, I will first satisfy them with the most exquisite food and drink. Ultimately, it is through the favour of the Dharma that I will establish them in the realm of peace and happiness. "I vow that in a future life, when I have attained Supreme Enlightenment, if sentient beings that are utterly destitute, lacking clothes to protect them from mosquitos and lies, heat and cold - and are suffering day and night – should hear my name, recite it single-mindedly and hold fast to it, their wishes will be fulfilled. They will immediately receive all manner of exquisite clothing, precious adornments, lower garlands and incense powder, and will enjoy music and entertainment to their heart's content. Manjushri, these are the Twelve Sublime Vows made by the World-Honoured Medicine Buddha Lapis Lazuli Radiance Tathagata, Arhat, the Perfectly Enlightened, when he was cultivating the Bodhisattva path. "Manjushri, as to these Great Vows made by the Medicine Buddha while he was following the Bodhisattva path – as well as the merits, virtues and adornments of his Buddha-land, I cannot possibly describe them all, not even if I were to speak for an aeon or more. However, this Buddha-land is utterly pure. You will find no temptations, no Evil Paths nor even cries of suffering there. In this land, the ground is made of lapis lazuli, the boundaries are demarcated with golden cords, the towns, towers, palaces, pavilions, as well as the balconies, windows and draperies are all made of the Seven Treasures. The merits, virtues and adornments of this realm are identical to those of Amitabha Buddha's Pure Land in the west. "In this land dwell two great Bodhisattvas, Universal Solar Radiance and Universal Lunar Radiance. Among the countless Bodhisattvas, they are the leaders. Each in turn will serve as successor to the Medicine Buddha and as the able guardian of His True Dharma treasury. For these reasons, Manjushri, all devout men and women should vow to be born in this land. "There are sentient beings who cannot tell right from wrong. They are greedy and mean, do not practice charity and do not understand the rewards of generosity. They are ignorant and unintelligent. Lacking the foundations of faith, they amass riches, which they assiduously hoard. Whenever they come across anyone seeking charity, they become annoyed; if forced to give, they feel as much pain and regret as if they were parting with their own flesh. "Moreover, there are also countless sentient beings that are miserly and avaricious. They spend time amassing wealth, while not daring to spend it even on themselves, let alone on parents, spouse, children, servants or beggars. Upon their death, these stingy persons will descend onto the paths of hungry ghosts or animality. "However, even though they may suffer such a fate, if in a previous existence in the human realm they happened to hear the name of the Medicine Buddha, and now recall and recite his name, even briefly, they will immediately vanish from the Evil Paths to be born once more among humans. However, they will remember their stay on the Evil Paths and, dreading their past suffering, will cease to wallow in worldly pleasures. They will gladly practice charity themselves, praise others who do so and will no longer be stingy. "Eventually, they will even be able to donate their head, eyes, limbs, blood, flesh or other parts of their bodies to those who need them, not to mention mere material possessions. Moreover, Manjushri, there are sentient beings who have accepted the teachings of the Tathagata but have violated the Precepts (moral rules). Or, they have not violated the Precepts, but have broken the regulations. Or else, while they have violated neither the Precepts nor the regulations, they have disparaged Right Views; or they have not disparaged Right Views but have abandoned extensive study of the Dharma and thus cannot explain the profound meaning of the sutras preached by the Buddha. Or else, although they may be learned, they have grown conceited. Because conceit clouds the mind, they believe that they are in the right and others are in the wrong. Therefore, they deprecate the correct Dharma - and ally themselves with demons. "Such deluded persons not only follow wrong views themselves, they also lead countless other sentient beings into the same great pitfall. These sentient beings are bound to wander endlessly on the paths of hell, animality and hungry ghosts. "Yet, if they should succeed in hearing the name of the Medicine Buddha, they will abandon their evil conduct forthwith to cultivate wholesome ways, and thus avoid descending upon the Evil Paths. "Even those who cannot abandon evil practices or cultivate wholesome teachings, and thus descend onto the Evil Paths, can still benefit from the awesome power of the Medicine Buddha's past vows. If through this power, they should hear his name even briefly, their lives on the Evil Paths will end and they will be born again in the human realm. They will hold correct views, diligently pursue their practice and tame their minds. They will then be able to abandon the home life to become monks or nuns. They will uphold and study the Dharma of the Tathagatas rather than disparaging and violating it. With correct views and extensive study, they will fathom the extremely profound meaning of the teachings, abandon all conceit and cease to disparage the correct Dharma. They will no longer have demons as companions, but will gradually cultivate the practices of Bodhisattvas and swiftly perfect them. Moreover, Manjushri, there are sentient beings who are avaricious, envious, jealous and accustomed to praising themselves and disparaging others. They are bound to sink onto the three Evil Paths, suffering intense misery for countless thousands of years. When this intense suffering comes to an end, they will be born in the human world as oxen, horses, donkeys or camels. Often beaten and mistreated, they will suffer hunger and thirst and constantly travel along the road carrying heavy loads. If they succeed in returning as human beings, they will be among the poor and lowly, always serving others, constantly receiving orders, never being free. However, if any of them, in a former incarnation as a human being, have heard the name of the World-Honoured Medicine Buddha and, as a result of this good cause, now remember and single-mindedly take refuge in him, they will, thanks to this Buddha's spiritual powers, escape all suffering. Their senses will be sharp and they will be wise and learned, constantly seeking the supreme teachings, and meeting with good spiritual friends. They will break forever through Mara's net, smash the shell of delusion, dry up the river of afflictions and thus escape all the worry and suffering of birth, old age, disease and death. Moreover, Manjushri, there are sentient beings who love to quarrel, create schisms and engage in legal disputes. They constantly snake themselves and others suffer, creating and increasing all kinds of evil karma with body, speech and mind. "They plot against one another without mercy, while invoking the spirits of mountains, forests, trees and tombs. "They kill sentient beings and use their lesh and blood to propitiate the Yaksha and Rakshasa demons. They may also write down the names and make images of those against whom they harbour grudges, curse them with evil mantras or try to harm or kill them with potions, witchcraft or demons-raised-from-the-dead. "However, if the victims succeed in hearing the name of the Medicine Buddha, none of these evil practices can harm them. Moreover, everyone concerned will develop compassionate minds, endeavouring to benefit and bring peace and joy to others. "They will abandon their harmful thoughts and their angry, spiteful minds and all parties will be happy and satisfied with what they have. "They will cease to encroach upon others but will instead seek to benefit one another. "Moreover, Manjushri, within the Fourfold Assembly of Bhikshus, Bhikshunis, Upasakas and Upasikas, as well as among other men and women of pure faith, there are those who are able to adhere to the Eight Precepts for a full year or for three months a year, dedicating these good roots toward rebirth in the Western Pure Land of Amitabha, the Buddha of Infinite Life, so as to listen to the correct Dharma. will traverse space and descend to show them the way. They will thereupon be reborn spontaneously in jewelled flowers of many hues. "Moreover, there are those who are born in the celestial realms, thanks to [hearing the name of the Medicine Buddha]. Despite their birth in the celestial realms, their good roots are still not exhausted, and thus they will not be born again on the Evil Paths. When their life-span in the celestial realms comes to an end, they may return to the human world as Wheel-turning Kings, ruling over the Four Continents [around Mount Shumeru]. With awesome virtues and ease, they will set countless hundreds of thousands of sentient beings onto the path of the Ten Virtues. "Or else, such persons may be born as Kshatriyas (the military ruling class), or Brahmins or laymen of great families, with abundant wealth and overflowing granaries and storehouses. They will be endowed with noble features, numerous family members and retainers, as well as intelligence, wisdom, bravery, vigour and the imposing demeanour of a great hero. Likewise, if there is any woman who hears and single-mindedly holds fast to the name of the Medicine Buddha, she will never again be born in female form. Manjushri, after the Medicine Buddha attained Supreme Enlightenment, he realized, by virtue of his past vows, that sentient beings endured various ailments, such as emaciation, crippling disabilities, fever, dysentery, jaundice, etc. Some were the targets of black magic or various poisons, while others suffered short lives or untimely death. At that time, seeking to put an end to these miseries and fulfil the desires of sentient beings, he entered a samadhi called “Eliminating All the Suffering and Afflictions of Sentient Beings”. As soon as the Medicine Buddha, in his radiance, had uttered this Dharani, the entire cosmos rumbled and shook. Brilliant lights shone forth, allowing all sentient beings to escape disease and suffering and enjoy peace and happiness. Manjushri, if you come across any man (or woman) suffering illness, you should constantly cleanse him, bathe him and rinse his mouth. You should single-mindedly recite this Dharani 108 times on his behalf, over his food, medicine or water from which insects have been removed. Once he has consumed the food or drink, his illness and suffering will disappear. If the patient has a particular wish and single-mindedly recites this Dharani, his wish will be fulfilled. He will be free of disease, enjoy a longer life and, at death, be born in the realm of the Medicine Buddha. He will then be beyond retrogression and eventually realize Supreme Enlightenment. "Therefore, Manjushri, any man or woman who single-mindedly reveres and respectfully makes offerings to the Medicine Buddha should constantly recite this Dharani, never letting it out of his mind. "Moreover, Manjushri, upon hearing the various names of the Medicine Buddha Lapis Lazuli Radiance Tathagata, Arhat, the Perfectly Enlightened, men and women of pure faith should recite and hold fast to this name. "Each morning, at dawn, having bathed themselves and cleaned their teeth, they should make offerings of fragrant flowers, incense, perfume and various kinds of music before an image of this Buddha. Furthermore, they should copy this sutra or have others do so, as well as single-mindedly recite it and listen to explanations of its meaning. "They should offer all the necessities of life to the Dharma masters who teach this sutra, making sure they lack nothing. "In this way, devout men and women will be under the protection of the Buddhas. All their wishes will be fulfilled and they will eventually realize Supreme Enlightenment." "O, World-Honoured One, I vow that in the Dharma Semblance Age, I will use every skilful means to help men and women of pure faith hear the name of the World-Honoured Medicine Buddha. Even in their sleep, I will awaken their consciousness with the name of this Buddha. "O, World-Honoured One, if any devout persons should read, recite and uphold this sutra, or lecture upon it, explaining its meaning to others, or copy it or have others copy it, or if they should pay it the utmost reverence, adorning it with fragrant flowers, perfumes, incense powder and sticks, garlands, necklaces, banners, canopies, dance and music and protecting it with precious, multicolour cloth - and if they should prepare a clean site, erect a high altar and place the sutra upon it - the Four Great Celestial Kings, their retinues as well as countless hundreds of thousands of other divinities, will thereupon proceed to this place to make offerings and guard this sutra. will be free of untimely death. In that place, there will no longer be evil demons or spirits to sap the vital energy of the people. "Even if there were, these devout men and women would recover, enjoying good health and peace of mind. "So be it, so be it, Manjushri. It is just as you say. If men and women of pure faith wish to make offerings to the World-Honoured Medicine Buddha, they should first make an image of this Buddha, and then place it upon a pure, clean altar. They should scatter all kinds of flowers, burn all varieties of incense and adorn the place with banners and pennants. For seven days and nights they should adhere to the Eight Precepts, consume only pure food, bathe and perfume themselves, put on clean, fresh clothing and keep their mind undefiled, free of anger or malice. They should develop feelings of kindness, compassion, joy and equanimity toward all sentient beings, while bringing to them benefits, peace and happiness. They should play music and sing the praises of the Medicine Buddha, while cycling around his image in a rightward [clockwise] direction. Moreover, they should bear in mind his merits, virtues and past vows, while reading and reciting this sutra, reflecting on its meaning and explaining it to others. "Whatever they wish, will then be fulfilled – whether it is longevity, wealth or anything else, such as an official position or the birth of sons and daughters." Moreover, if any sentient beings suddenly suffer nightmares and witness all kinds evil omens - such as locks of strange birds, or hundreds of ominous signs throughout their homes - they need only venerate the World-Honoured Medicine Buddha with all kinds of wonderful offerings, and the nightmares, evil omens and inauspicious signs will all disappear, no longer able to cause them harm. "If any sentient beings are in fear of water, fire, knives, poison, falling off a precipice, or of vicious beasts – such as wild elephants, lions, tigers, wolves, bears, venomous snakes, scorpions, centipedes, millipedes, [infectious] mosquitos or gnats - they need only single-mindedly recall and recite the name of the Medicine Buddha, while respectfully making offerings to him, and they will escape all these terrors. If a country should be subject to foreign invasion, banditry or rebellion, the inhabitants need only recall and recite the name of the Medicine Buddha, while paying homage to him and all these calamities will likewise disappear. "Moreover, Manjushri, there are men and women of pure faith who throughout their lives have not worshipped any deities, but have single-mindedly taken refuge in the Buddha, the Dharma and the Sangha and upheld the Precepts - the five or ten lay Precepts, the 400 Bodhisattva Precepts or the 250 Bhikshu or 500 Bhikshuni Precepts. However, if any of them have violated the Precepts they have taken and fear falling onto an evil path, they should concentrate on reciting the name of the Medicine Buddha and respectfully make offerings to him. They will then certainly avoid rebirth on the Three Evil Paths. "If women who experience extreme pain during childbirth can, with utmost sincerity, recite the name of the Medicine Buddha, praise, venerate and make offerings to him, they will be relieved of their suffering. "The children born to them will be without defects, attractive in appearance, causing those who see them to rejoice. They will be endowed with keen senses and intelligence, along with a quiet disposition. They will seldom become ill, nor will evil spirits sap their vital energy." 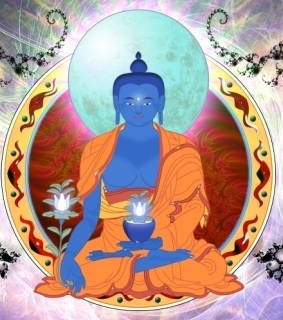 "I have just extolled the merits and virtues of the World-Honoured Medicine Buddha. These merits and virtues are the extremely profound practices of all Buddhas, but are difficult to explain. Do you have faith in them or not? Ananda respectfully replied: "O, Great Virtuous World-Honoured One, I do not have any doubts about the sutras preached by the Tathagatas. Why? It is because the Tathagatas' karma of body, speech and mind are all pure. O, World-Honoured One, the sun and the moon may fall, Mount Shumeru, the majestic king of mountains, may tremble, but the words of the Buddhas can never change. Because of this lack of faith, they even develop disparaging thoughts, thus forfeiting great benefits and remaining in the long, dark night [of ignorance]. They descend onto the Evil Paths, revolving along them without end. "O, Ananda! Even the Shravakas, Pratyeka Buddhas and Bodhisattvas who have not reached the Ten Grounds (Stages) cannot understand and believe in this truth. Only the Bodhisattvas who are one lifetime away from Buddhahood can. "O, Ananda! A human rebirth is difficult to achieve; however, to believe in, respect and honour the Triple Jewel is even more difficult. To hear the name of the World-Honoured Medicine Buddha is more difficult still. "O, Ananda, the Medicine Buddha has cultivated countless Bodhisattva practices, employed countless skilful means and made countless far reaching vows. If I were to take an aeon or more to recount them, the aeon would come to an end before I could exhaustively describe all these wonderful practices, vows and skilful means. "O, Great Virtuous World-Honoured One, in the Dharma Semblance Age, there will be sentient beings who suffer numerous calamities, and are always sick and emaciated, unable to eat or drink, their throats dry and lips parched, their eyes seeing darkness everywhere. As the signs of death appear, they are surrounded by parents, family, friends and acquaintances weeping and lamenting. "As such a patient lies in bed, he sees the messengers of Yama arrive to lead his consciousness before this King Of Justice. Now, all sentient beings have inborn spirits who record everything they do, both their transgressions and their merits. These spirits then present the patient 's entire record to King Yama. "At that time, the King questions the dying person and tabulates his good and bad karma before deciding upon his fate. "If, at that point, the relatives and acquaintances of the patient are able to take refuge in the World-Honoured Medicine Buddha on his behalf, invite monks and nuns to recite this sutra, light seven-tiered lamps and hang multi-coloured longevity banners, his consciousness may return then and there, and he will see himself clearly, as though in a dream. "Or else, after 7, 21, 35 or 49 days, when his consciousness returns, as if awakening from a dream, he will recall his good and bad karma and the consequences thereof. "Having personally witnessed the consequences of karma, he will never again create evil karma, even if his life is in danger. Therefore, men and women of pure faith should uphold the name of the Medicine Buddha, venerate and make offerings to him according to their means. Ananda then asked the Bodhisattva Salvation: "Good Man, how should we venerate and make offerings to the World-Honoured Medicine Buddha and how should we make the longevity pennants and lamps? "The Bodhisattva Salvation replied: "Virtuous One, in order to help the patient recover, you should adhere to the Eight Precepts for seven days and seven nights, make offerings of food, drink and other necessities to a [group of] monks and nuns in accordance with your means, pay homage and respectfully make offerings to the World Honoured Medicine Buddha six times a day and recite this sutra forty-nine times. You should light forty-nine lamps, make seven images of the Medicine Buddha and place seven lamps, each as large as a cartwheel, before each image, letting them burn continuously for forty-nine days and nights. "You should also make multi-coloured banners, forty-nine hand-lengths long. "Furthermore, you should release forty-nine species of animals [thus sparing their lives]. The patient may then escape danger and will not be under the sway of evil demons, nor subject to untimely death. Moreover, Ananda, when the anointed Kshatriya kings find themselves beset by calamities, such as epidemics, foreign invasion, internal insurrection, an adverse alignment of the stars, an eclipse of the sun or the moon, unseasonable storms or a failure of the monsoons, they should develop compassionate feelings toward all sentient beings. "They should also pardon prisoners and make offerings to the World-Honoured Medicine Buddha in accordance with the rites described earlier. Thanks to these good roots and the power of the Medicine Buddha's past vows, peace and stability will immediately return to the affected countries; the rains and winds will be favourable; crops will mature on time and everyone will be healthy and happy. The country will be free of evil Yakshas out to harm the populace. All the evil omens will immediately disappear, and these anointed Kshatriya kings will enjoy greater longevity and vitality, finer appearance as well as greater health and freedom than ever before. "O, Ananda, the queens, consorts, princesses, royal heirs, great ministers, court ladies, officials or commoners who suffer disease and other misfortunes should also make offerings to the Medicine Buddha. They should make multi-coloured longevity banners, light lamps, ensuring that they burn continuously, liberate all kinds of animals, scatter lowers of various colors and burn various kinds of incense renowned for their fragrance. They will then recover from disease and escape misfortune. "Ananda then asked the Bodhisattva Salvation: "Good Man, how an expiring life-span can be lengthened?" The Bodhisattva Salvation replied: "Virtuous One, did you not hear the Tathagata explain the nine forms of untimely death? I would urge everyone to make longevity banners and lamps and cultivate merits and virtues. Thanks to such cultivation, they will escape suffering and misfortune throughout their lives. Ananda further asked: "What are the nine forms of untimely death? "Some sentient beings contract a minor illness which goes untreated for lack of a physician or medicine; or else, even though there is a physician, he prescribes the wrong medicine, causing premature death. Or, the patients, believing the false pronouncements of earthly demons, heretics or practitioners of black magic, may panic – unable to calm their minds. They may then engage in divination or perform animal sacrifices in order to propitiate the spirits, praying, for blessings and longevity - all in vain. Through, ignorance, confusion and reliance on wrong, inverted views, they meet with untimely death and sink into the hells, with no end in sight. This is the first form of untimely death. "The second form is execution, by royal decree. "The third is losing one’s vitality to the demons through hunting, gambling, debauchery, drunkenness or extreme dissipation. "The fourth is death by ire; the fifth is death by drowning. The sixth is being devoured by wild animals. "The seventh is falling off a mountain or a cliff. The eighth is death by poison, incantations, evil mantras or demons-raised-from-the-dead. The ninth is from hunger or thirst, for lack of food and water. These are the nine forms of untimely death; mentioned by the Tathagatas. There are also countless other forms, which are too numerous to describe. "Moreover, Ananda, King Yama is responsible for keeping the karmic register of everyone in the world. If sentient beings have been unfilial, committed the Five Cardinal Sins, disparaged the Triple jewel, broken the laws of the land or violated the major Precepts, King Yama will mete out punishment according to the infraction. Therefore, I urge sentient beings to light lamps, make banners, liberate animals and cultivate merits in order to avoid suffering and misfortune. "O, World-Honoured One, today, thanks to the Buddha's awesome power, we have succeeded in hearing the name of the Medicine Buddha and no longer fear descending onto the Evil Paths. "Together, with one mind, we take refuge in the Buddha, the Dharma and the Sangha for the rest of our lives and pledge to support all sentient beings – bringing them genuine benefits and joy. "Wherever this sutra circulates or wherever there are sentient beings who hold fast to the name of the Medicine Buddha and respectfully make offerings to him, whether in villages, towns, kingdoms or in the wilderness, we will all protect them. "We will release them from all suffering and calamities and see to it that all their wishes are fulfilled. "Sentient beings afflicted by disease or calamity and wishing to escape should also read or recite this sutra. They should 'knot' our names with multi-coloured strands untying them when their wishes are fulfilled. Thereupon, Buddha Sakyamuni praised the great Yaksha generals with these words: "Good indeed, good indeed, great Yaksa generals! Those of you who wish to repay the benevolence and the virtues of the WorldHonored Medicine Buddha should always benefit and bring joy to all sentient beings in this way. Ananda then asked the Buddha: "World-Honoured One, what should we call this teaching, and how should we adhere to it and put it into practice? "This teaching is called the 'Past Vows, Merits and Virtues of the Medicine Buddha' or the "Dharani of the Vows of the Twelve Yaksa Generals to Benefit Sentient Beings' or “Eradicating of All Karmic Obstacles”. You should uphold it as such." When Buddha Shakyamuni finished speaking, the great Bodhisattvas, as well as the great Shravakas, kings, ministers, brahmins, lay-persons, devas, nagas, yaksas, gandharvas, asuras, garudas, kinnaras, mahoragas and other human and non-human beings all rejoiced at the Buddha's words. They faithfully accepted them and put them into practice.